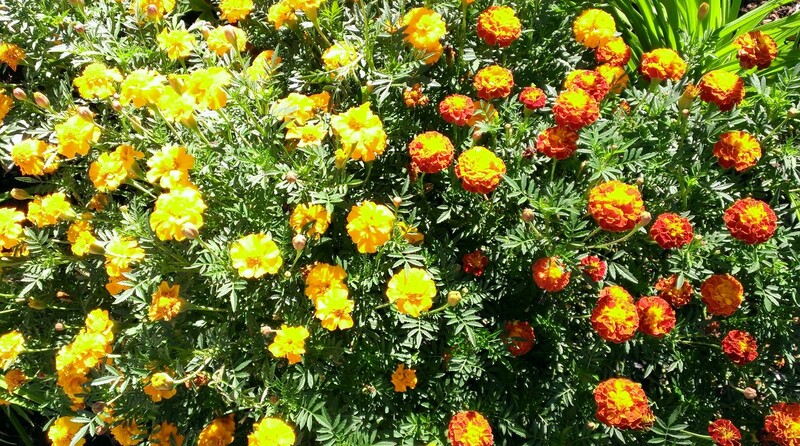 Marigolds are truly the ROCK STAR in my flower garden this year. They are the clear winner of all the flowers that I’ve planted. We started these plants as seeds in our greenhouse and set them out to fill gaps in the other plants – just filler flowers. However, WOW, did they ever come alive! Marigolds have never been at the top of my list of favorite flowers. I have always admired their great abundance of flowers in my favorite colors of yellow, orange and red. They have met most but not all of my criteria of ‘loved’ flowers. My flower gardening love goes to plants that have an abundance of beautiful flowers while being resilient to the environment. Flowers have to be hearty and hold up to heat and drought – not be wimpy and die easily. Let’s face it, most of us work for a living and can’t be a slave to our gardens – as much as we would love to. Marigolds have always met these two criteria. My complaint against Marigolds is that they turn ugly once the blooms begin to die. 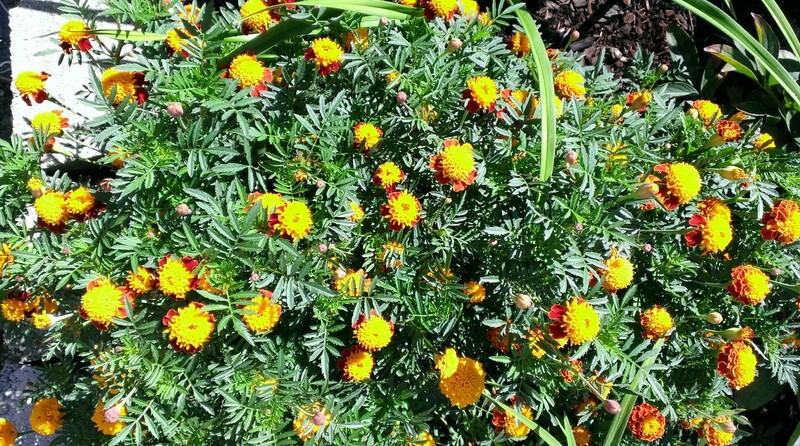 You have to actively deadhead Marigolds or else they look bad in your garden. I don’t like high maintenance plants and this has always seemed like a high maintenance plant. I have found that deadheading them is easier than I previously knew. You only have to bend the dead flower sideways and it just snaps off – easy. I just drop them on the soil to compost naturally. Like eating potato chips – where the crunch feels good, the snap of these flowers is a tactile pleasure. I now know that Marigolds ROCK! 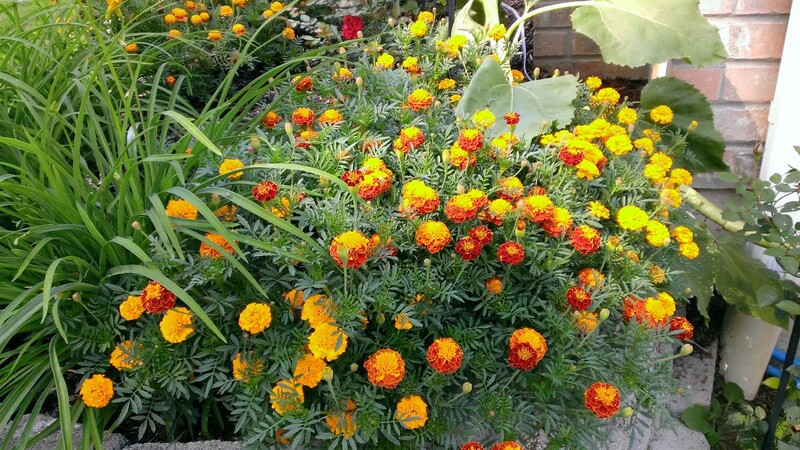 Gallery | This entry was posted in Gardening and tagged Flowers, Marigolds. Bookmark the permalink. Like you, Sheri, my appreciation for marigolds has grown considerably over the past year. I love their color, they perform extremely well and I don’t mind the deadheading because I save seeds for following season. Long live marigolds! Love the idea of capturing the seeds for the next year. I’ll do that too! Thanks.